I've just been reading a new book I picked up last night—"Benedict's Way" by Lonni Collins Pratt and Father Daniel Homan. In thirty short chapters, the authors examine the Benedictine code and how it may be applied to anyone's life. Since I find it difficult to sit still and reflect on reading materials such as this, I am going to attempt to reflect on one chapter per week, every Wednesday, using this blog to do so. I hope this will benefit not only myself, but anyone else who happens to stumble upon my blog. This thought gets right to the heart of the problem I just mentioned. Why is it so hard for me to reflect on books or sermons or art? I have learned more and more that I learn best when engaged in dialogue. I need to talk to someone about a given subject in order to truly digest it. But dialogue implies listening. Do I really listen to those I am dialoguing with or do I spend much of the time formulating the next thing I'm about to say? Most importantly, how much do I listen to God in prayer? How often do I attend to Him with the ear of my heart? Am I looking for him throughout the day, listening for his guidance, or am I too busy theologizing? I have a yearning for more quiet moments...moments I usually only get when I'm in the bathroom. Have you ever noticed how much thinking you can get done in a bathroom? It's because your life is disengaged from all the "doing" of life. Sometimes when I'm in the shower I can't even remember what I've washed! Did I just shampoo my hair? It's because I'm so involved with my thought process. How can I carry that over into a lifestyle of listening? Lord, may I spend more time listening to others this week. And may I develop my ability to listen to you. I, like many people, am really tired of the categories of liberalism and conservatism. I try not to care which category people want to stick me or my views into. If by conservative they mean that I care about tradition and the honest desire to hold on to orthodoxy and biblical morality, then great. If by liberal they mean that I care about innovation and the honest desire for openness and exploration—if they mean that I’m still trying to figure out what true orthodoxy and biblical morality are all about, then that’s just as wonderful. But really, I have to tell you that I’d prefer to do without either label. In my opinion, they have reached their expiration date for usefulness. We need to get over who’s liberal and who’s conservative and just be Christians living in the kingdom of God. Click here before reading this article. In "The Gospel in a Pluralist Society," Lesslie Newbigin refers frequently to Michael Polanyi's concept of "plausibility structures." Every culture, Polanyi says, has its own web of belief—its own complex structure by which it decides what constitutes rational thought. Many variables are brought to bear on this structure, including the circumstances a society finds itself in, the history of its circumstances, and even the traditional ways of thought imbedded in their language. If this is true, where does our plausibility structure, as Christians, come from? What we deduce to be reasonable (i.e. our plausibility structure) should come from the historical background of our "family." According to Galatians 3:7, we are "children of Abraham," and as such we have a rich heritage of philosophy, poetry, prophecy, and prose that should inform our thought process. This thought process, then, would inform our daily lives. This process should not stop with the Old Testament, however, nor with the New. We are children of a new covenant and a new tradition which continues to this day. What I am trying to say is that we must not uncritically reject any of that tradition in forming our present plausibility structure. Some would have us go back to the beginning, so to speak. We are supposed to imagine what the 1st century church was like and do the same. But that is to assume that the real church died shortly therafter. The Holy Spirit came to the church ca 33 AD...are we to think he took off again half a century later? None of this is to say that we should not question tradition. When tradition is discovered to inadequately deal with truth, in any way, it must be changed. In the fundamentalist/evangelical church, we have a group of people with a relatively young tradition. In many ways, this particular tradition unfortunately rejected its roots wholesale. It is a culture locked in a particular time and place, which hopefully will not stay there forever. Some of us, having come out of that static microcosm, have seen the wisdom in looking both backward and forward. May we continue to consider the necessity of tradition in helping us to seek truth. 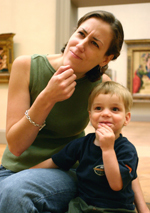 Yesterday, I took the family (pictured pondering at left) to the Metropolitan Museum of Art. We have decided to try to do something related to the arts once per week. It was a good day, including some great bread and a potato chip salad we ate at Eli's Bread Company, on 91st St. The only major bummer was a little gift we received from the city...a $65 parking ticket. The museum's lot was full and we were forced to park on the street, where we could only put in enough quarters for an hour at a time. Thank you, New York, for once again entrapping your coveted visitors! One of the special exhibitions we saw a collection of Byzantine art. We didn't have long in any of the exhibits, but I had the chance to ponder icons, tapestries, and a box of relics from saints. It always amazes me how alien people can look in a painting done by someone from another culture and time. They are still human, but so different. It reminds me of how different someone's perspective can be. Our cultural heritage affects even the way we view what it means to be human. We ended the day by looking at "Girl With a Pearl Earring." We have the movie-based-on-the-book-based-on-the-painting coming from Netflix. I am struck by her winsomeness...the way she glances backward with a look of simple contentedness...the way the light seems to enjoy lightly bathing her forhead and the ruffles of her clothing. That smile makes me think she gets it—she can be happy despite simple circumstances. Anyway, that was our art day and, our present from the parking police aside, it was worth the trip. EDIT: I had originally thought the painting on the right was "Girl With a Pearl Earring," but later corrected myself in this post. 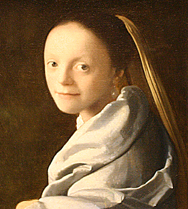 This painting is also by Vermeer, but is called Study of a Young Woman. Mystic River is a depressing movie about people who insist on taking care of business on their own terms. I'm not sure Clint Eastwood belongs in the director's chair, much less writing the score. The music was often jarring, his choice of timbres and musical ideas serving to distract me from the plot. As far as visuals, I understand the river was supposed to be a metaphor for something or other, but how many shots of it do we actually have to endure? The only redeeming quality of the film was the fine acting done by Tim Robbins, Sean Penn, and Marcia Gay Harden. Tim Robbins was haunting to watch. His character, Dave Boyle, is kidnapped by child molestors early in the film. He manages to escape after several days, but is scarred for life. We see inside his mind through several, well-delivered soliloquys. He tells his sleeping son, for example, of the boy who escaped from wolves. In a conversation with his wife, he wonders if vampires ever get used to being vampires, forgetting what it was like to be human. Don't read on if you don't want the plot to be spoiled. The truly sad thing about this movie is that none of the characters have a true sense of justice. An innocent girl is killed because of simple, childlike jealousy. Her father seeks vengeance at any cost, unwilling to trust his detective friend to do the job. The father kills his childhood friend in a complete act of idiocy, driven by rage. The cop lets one of the real "badguys" go, knowing that he has murdered at least two people. The most telling scene of injustice, however, is near the end when Jimmy Markum's wife convinces him that his actions were okay because he had the right intentions. And besides, his other daughters are still depending on him. I guess it's the thought that counts, right? Yeah, I killed the wrong guy...but it's the thought that counts! 1. How does the sense of justice portrayed in this film compare with the biblical concept of justice? 2. How can we, as followers of Christ, be healers to people like Dave Boyle? How can we help people who are carrying around so much pain and distress? As I mentioned yesterday, I'm not really into death. I suppose this is a good thing, but I wish it didn't trouble me quite so much. I'm supposed to "know for sure that when I die I'll go to heaven," right? That reminds me of an experience my wife had as a young Christian. We went to a local event and the speaker told some story about an airplane crashing if I remember correctly. Fun stuff. Then he asked that age-old question...or is it that old? Did Paul ask that kind of question? Did Jesus? Can someone please explain that to me one more time? Anyway, getting back to my wife, the plane full of dead people, and the perfect assurance thing. The preacher asked the "do-you-know-for-sure" question. If he was like a lot of these guys, he probably went on and on about it, leaning heavily on the doubts of his listeners. "Do you know beyond a shadow of a doubt?" You know the sort of questions. Well, my wife was crushed. Her fragile, fledgling faith was a pile of mush by the time he was done with her. I remember walking to the car with her, getting away from the crowd so we could talk. I don't remember what I said, but I suppose it helped. It's hard to undo that kind of damage, though, isn't it? I don't know if this is helpful to anyone, but I'm a pastor and I'm scared of death. I believe in Jesus, but I don't always know that he's really there. Is that a sign of my immaturity in Christ? Probably. Does it also mean I'm just a real person? Most definitely. I had a near death experience last night. It happened while watching the film "In America." It's the story of an Irish family who are moving to the Big Apple not long after one of their children has died. They move into a nasty building, which is known for the junkies who live there. They deal with issues of death and life in a powerful way. I definitely recommend that you see the film. I, like most people, try not to get too close to death most of the time. It's only at the occasional funeral or while watching a film like this that I come face to face with my own mortality and that of my loved ones. I have never had someone very close to me die accept one of my good friends from High School. Something smells wrong about death, you know? It's just not fair. That might sound like an oversimplified statement, but for me, it captures at least one of the raw feelings I associate with death--unfairness. I happen to believe we cannot communicate with the dead. But I wonder why not. I wish we could. Wouldn't it be so much simpler if we could just talk to them about the afterlife? This brings me to a bigger question that's been bothering me. Why is God so reticent? When I ask him a really important question, why doesn't he answer me back? And I mean in an audible voice, none of this "I know in my heart" stuff! Maybe we do know in our hearts. I understand that. I've been taught all the theologically correct stuff about discerning the will of God and so on. But wouldn't a simple phone call be so much more effective? How about an e-mail every now and then? I could print it out and carry it around as a reminder of what God would like me to be doing that week. Once there was a storyteller who wove magical tales about an entire world of people, places, and things. He told the stories with all of his being...movements, the tone of his voice, the dramatic pauses all combined to create something real. He had a particular lilt in his voice, unmatched by anyone or anything, which made the stories come to life. They took on a life of their own, his characters a reflection of the teller. Yet somehow, they were so life-like that they became more than just "like life." They became real. The listeners could imagine what might happen next, but they could never be too sure. In fact, the storyteller allowed his characters to begin to write their own story. But something awful happened...the characters turned on the storyteller. Not that he did not anticipate this, mind you. There was a greater theme behind this story than you might first anticipate. Something so big that when people first hear of it, they know deep down inside that it must be true. The characters of this new story began to go their own way and immediately trouble ensued. On their own, the characters turned on themselves, threatening to erase any meaning the story ever had. "You will change the story for the better. You will help people to be a part of the original plot-line." As the storyteller expected, this character with a new name went right ahead and avoided his new mission. But inside of him was a little speck of a dream...a vision of what might be. And somehow that was enough. He and his children and his children's children carried that dream with them. That family became a whole nation of storytellers within the story. They sung and spoke to each other about the bigger story--the storyteller's original plotline. They celebrated the steps the storyteller took to keep the dream alive inside of them. Oh, they suffered, too. And they did the wrong things. Sometimes, in fact, they were as unlovable as they were loved. And one day, a day just like any other, it happened. The storyteller wove himself into the story in a new, completely implausible way. He actually became a character in the story, one of the children of this "people of the dream." Not a superman or woman, not some kind of Herculean, half-god hero. But a real character. And this character began to say things...and do things that...well, that sometimes didn't make any sense. The perspective of this new character was so new, so unusual, so BIG. What this character said and did were almost too big, or so it seemed. This character made such a mess of the petty, misguided lives he came into contact with that some of them began to change dramatically...some for the better...and some for the worse. Some of the characters did not want to change. They had missed the point of the story for so long that they no longer recognized the original storyteller. And so they killed him. They murdered the author of their lives. They thought they could do away with him. They thought they could go on doing what they wanted to do, rejecting the original plot-line for their own twisted desires. Would it seem like cheating if I told you the "storyteller/real character" didn't stay dead? Does that sound too much like a classic Deus ex machina? Well, I have to tell it like it is. Maybe you can see that this is exactly what had to happen. This is somehow what the storyteller had planned all along. It was a part of the original plotline. And so the storyteller came back to life, once again amazing his characters. He succeeded in reigniting that original spark of a dream...that idea that the story can be changed back. That the original plot-line, the happy ending everyone was hoping for but was afraid to live for, could really be resuscitated. The storyteller really was going to finish the story. Some day, when the last notes of this epic ballad were sounded, the story would all make sense. Everything would fall into place and every character would get to see how their little stories fit into the big story. This story wouldn't be a real one if every character bought into this dream. Some of them refused to acknowledge it. Some of them actively opposed it...and still do. But some of them are spending their days and nights trying to make the "bigger" story come alive in a whole new way. They seek to write their own part of the story as an important sub-plot in this grandest of epics. They look forward to the finale, dwelling on its outcome, but focusing all the more on the words that are written today. They think about that time when the storyteller became a real character...and they imagine what might, no, what will be.